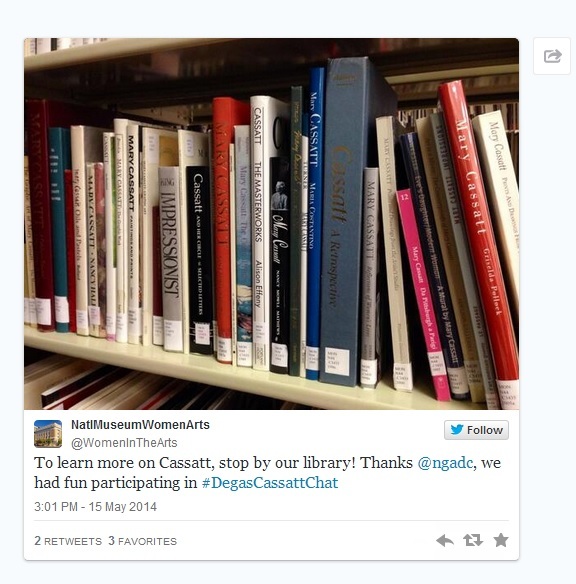 Spotlight on Twitter: #DegasCassattChat or #CassattDegasChat? The National Gallery of Art (NGA) recently opened Degas/Cassatt, an exhibition exploring the collaborations and interactions of Edgar Degas and Mary Cassatt. NGA hosted a Twitter chat shortly after the opening to introduce the artists and exhibition to the public. 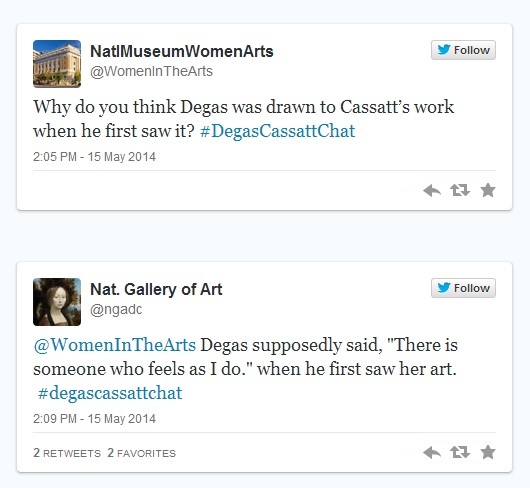 Anyone could take part in this conversation by using the hashtag “#DegasCassattChat” and posing questions or providing insight. NMWA has 11 Cassatt works in its collection and additional resources online and in the library. 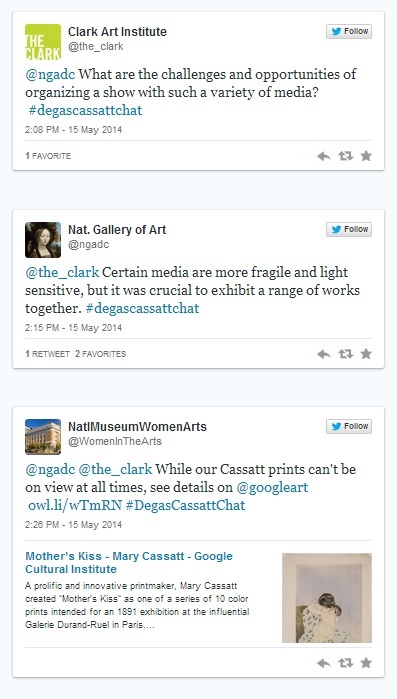 Members of NMWA’s social media team were thrilled to be able to join the #DegasCassattChat Twitter conversation to help tell Cassatt’s story. Research came first: Beginning in NMWA’s Betty Boyd Dettre Library and Research Center, museum staff members examined the life of Cassatt through various publications. New facts and interesting pieces of history came to light: artist Childe Hassam venerated her by saying “hers is the most notable name in the history of the graphic arts,” she encouraged her friends in America to purchase works by Degas, and she occasionally posed for Degas when he was in need of a model with an artistic inclination. Armed with this new information as well as online resources, NMWA was prepared to contribute to the conversation. Conservation arose as a theme in the Twitter chat. NGA’s postings included imagery that detailed the museum’s treatment and analysis of Cassatt’s Little Girl in the Blue Armchair oil painting, which, they note, is the only documented case of a work painted by both artists. The exhibition also features pastels and works on paper. Because NMWA’s Cassatt prints are so delicate they are not currently on view, but you can still examine details of Mother’s Kiss, Maternal Caress, and The Bath in high resolution on the Google Art Project. Additional conversation topics included the influence each artist had on one another, the artistic collaboration between both artists, and the significance of having an entire room in the exhibition dedicated to Degas’s drawings and prints of Cassatt at the Louvre. To learn more about Cassatt and Degas, check out the entire #DegasCassattChat conversation on Storify. Also, don’t forget to follow @WomenInTheArts on Twitter. This entry was posted in Advocacy, News and Updates by Women in the arts. Bookmark the permalink.